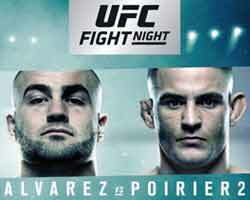 Review by AllTheBestFights.com: 2018-07-28, great fight between Eddie Alvarez and Dustin Poirier 2: it is close to get four stars (UFC Performance of the Night). The former Ufc and Bellator Lw champion Eddie Alvarez entered this fight with a professional mma record of 29-5-0 (79% finishing rate) and he is ranked as the No.1 lightweight in the world. He lost to Conor McGregor in 2016 (Alvarez vs McGregor) but then, in 2017, he faced Dustin Poirier (bout ended in a no-contest, Alvarez vs Poirier I) and he beat Justin Gaethje (Eddie Alvarez vs Justin Gaethje). 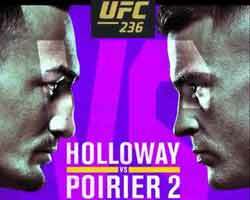 His opponent, the black belt in Brazilian jiu-jitsu Dustin Poirier, has an official record of 23-5-0 (78% finishing rate) and he entered as the No.5 in the same weight class. He was defeated by Michael Johnson in 2016 (Poirier vs Johnson) but then he has collected three victories and one no-contest (with Alvarez in their first fight) beating Anthony Pettis (Dustin Poirier vs Anthony Pettis) and Justin Gaethje in his last two (Dustin Poirier vs Justin Gaethje). 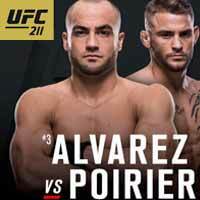 Alvarez vs Poirier 2 is the main event of UFC on Fox 30. Watch the video and rate this fight! Review by AllTheBestFights.com: 2017-02-11, great fight between Jim Miller and Dustin Poirier: it is close to get four stars (UFC Fight of the Night). The black belt in Brazilian jiu-jitsu and tae-kwon-do Jim Miller entered this fight with a pro record of 28-8-0 (64% finishing rate) and he is ranked as the No.17 lightweight in the world. He lost two consecutive fights between 2015 and 2016, the last one with Diego Sanchez, but then he has won over Takanori Gomi, Joe Lauzon (=Lauzon vs Miller 2) and Thiago Alves. His opponent, Dustin Poirier, has an official mma record of 20-5-0 (80% finishing rate) and he entered as the No.23 in the same weight class. He fought three times last year beating Joseph Duffy and Bobby Green (=Poirier vs Green) but then he was defeated by Michael Johnson (=Poirier vs Johnson). 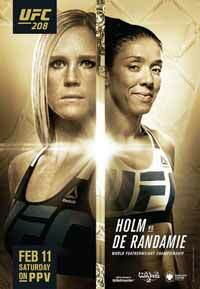 Dustin Poirier vs Jim Miller is on the undercard of Holly Holm vs Germaine de Randamie – UFC 208. Watch the video and rate this fight! Review by AllTheBestFights.com: 2016-09-17, spectacular finish between Dustin Poirier and Michael Johnson: it gets three stars (UFC Performance of the Night). The black belt in Brazilian jiu-jitsu Dustin Poirier entered this fight with a mma record of 20-4-0 (80% finishing rate) and he is ranked as the No.13 lightweight in the world. He lost to Conor McGregor in 2014 (=Poirier vs McGregor) but since then he has won four bouts beating Joseph Duffy and Bobby Green in 2016 (=Poirier vs Green). His opponent, Michael Johnson, has an official record of 16-10-0 (56% finishing rate) and he entered as the No.14 in the same weight class but he comes off two consecutive losses: against Beneil Dariush (=Johnson vs Dariush) and Nate Diaz (=Johnson vs Diaz). 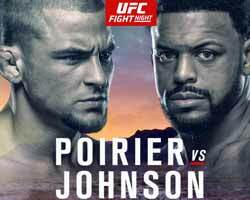 Poirier vs Johnson is the main event of the UFC Fight Night 94. Watch the video and rate this fight! Review by AllTheBestFights.com: 2016-06-04, good exchanges between Dustin Poirier and Bobby Green: it gets three stars. Dustin Poirier entered this fight with a pro record of 19-4-0 (79% finishing rate) and he is ranked as the No.21 lightweight in the world. He lost to Conor McGregor in 2014 (=Poirier vs McGregor) but then he has won three fights beating Joseph Duffy in his last one. His opponent, Bobby Green, has an official mma record of 23-6-0 (74% finishing rate) but he is not ranked as he hasn’t fought since November 22, 2014 when he was defeated by Edson Barboza (=Green vs Barboza). 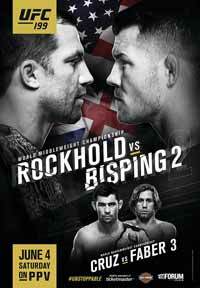 Poirier vs Green is on the undercard of Luke Rockhold vs Michael Bisping 2 – UFC 199. Watch the video and rate this fight! 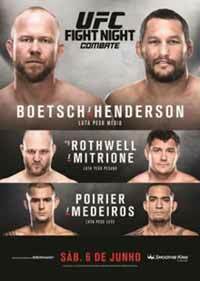 Review by AllTheBestFights.com: 2015-04-04, pretty good fight between Dustin Poirier and Carlos Diego Ferreira: it gets three stars (UFC Performance of the Night). 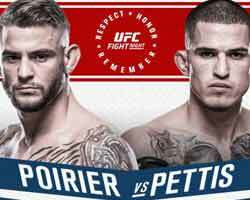 Dustin Poirier entered this fight with a professional mma record of 16-4-0 (81% finishing rate) and he is ranked as the No.17 featherweight in the world; he fought twice in 2014 beating Akira Corassani (=Poirier vs Corassani) but then he lost to Conor McGregor (=Poirier vs McGregor). His opponent, the black belt in Bjj Carlos Diego Ferreira, has an official record of 11-1-0 (64% finishing rate) and he entered as the No.39 lightweight; he fought three times last year defeating Colton Smith and Ramsey Nijem (=Ferreira vs Nijem) but then he suffered his first loss, against Beneil Dariush (=Ferreira vs Dariush). Poirier vs Ferreira is on the undercard of Chad Mendes vs Ricardo Lamas – UFC Fight Night 63. Watch the video and rate this fight!